We know a great way to support change is through learning. We’re dedicated to working with educators to create interactive, fun lesson plans and suggest ideas for curriculum. 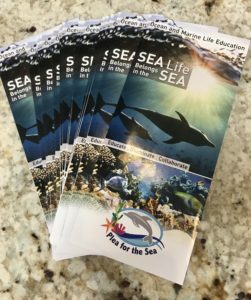 We’ve created a dolphin education packet (see the bottom of this page) that’s available to any interested teachers. If you’re an educator with a passion for helping kids learn about ocean animals… contact us. We’re open to new ideas, suggestions or projects from your class you’d like to share! Facilitators, city officials and restaurant owners, we are equally passionate about plastic awareness. We are available for speaking engagements that are fun, interactive and empowering! Contact us! Please email us at pleaforthesea@gmail.com. Getting our message out is key to helping phase out captivity. We support the efforts of local activists taking a stand against the dolphinarium in Scottsdale about once a month. In addition, we attend local festivals and events to share materials and speak with residents. We’re always seeking new ways to make an impact and to share with people the consequences dolphins face being held in captivity and why their innate and natural behaviors cannot be preformed in tanks. Yes, we might be living in the desert, but there are still many things we can do to save the oceans and protect it for future generations. Plastic waste is filling up our oceans and harming marine wildlife; changes today such as using reusable cups, tote bags and straws are easy solutions and change can begin today! By 2050 scientists predict that if changes aren’t made, there will be more plastic in the ocean than there are fish! One of our key goals is to support the efforts of other like-minded organizations. We are stronger together, and we are working to achieve many of the same goals. Our focuses are plastic awareness and captivity issues; we work hard at finding solutions and collaborating with others! We hope to help others understand that there is nothing truly educational about seeing captive animals up-close; the way a dolphin behaves in the wild is much different than how they behave for entertainment. Collaborating with groups dedicated to science-based, natural conservation is important to us. The future of our oceans is in our hands. Let’s find ways to work together to expand our collected reach. Let’s discuss solutions to create cleaner oceans and protect all of us! You can download a variety of teaching materials as PDFs by clicking here. We can also provide printed education packs upon request. Please contact us if you’d like a printed packet.